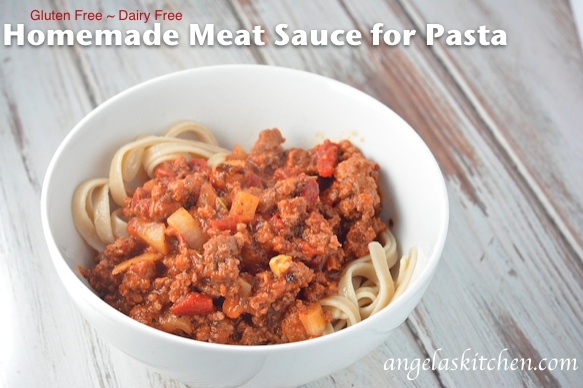 Simple flavorful meat sauce for pasta done gluten and dairy free. So good, you won’t miss the cheese! All you need is a bit of time to simmer the flavors together, so make a double batch on the weekend, allow to cool and freeze in meal sized batches. Enjoy! In a large pan over medium-high heat heat olive oil. Add onions and cook until onions are translucent. Add green peppers, garlic, beef and sausage. Brown the ground beef and sausage until completely cooked through and browned. Using a spoon, discard any excess grease in the pan. Pour in the wine or stock and simmer, allowing to reduce for about 1 1/2 minutes. Add the crushed tomatoes, sauce, tomato paste, sugar, salt, oregano, thyme, crushed red pepper and bay leaves. Stir to combine. Cover with a lid and simmer for about an hour, stirring occasionally. If the sauce needs more liquid while cooking, add a bit more water or broth. After cooking an hour, stir in minced parsley. Cover with lid and simmer for another half hour. Discard the bay leaves before serving.